Can anyone please tell how often blynk local server on raspberry pi write sd card. As everyone know sd card have limited life cycle, so it will be good if we reduce sd card write and dump data every few hour and use ram in between dumping data to card. I don’t need raw data. How can I reduce sd write ??? You could look at booting off the SD and then running on a small HD… you will have to Google for the how tos of that. Or just get quality SD cards that claim to be capable of balancing the load. I don’t really know for sure… I suspect it depends on whether you are using RAW DB or not? All I can say is that in the past I have seen files update on a frequent basis in my own Local Server. I am unaware of any form of memory buffer, so I still believe the data is “disk” based and other background actions like backup or DB flushing may be in addition to normal realtime data updating. Others have used Local Servers on RPi for years, but this is the first I recall hearing any concern about it (in reference to Blynk’s Server usage). Have you searched this forum for further info? My server is running for some 2 years for now (or even more?) and it is also serving: (aside from Blynk) mosquito, node-red, miniDlna, Samba server (not heavily accessed) and from time to time Jdowloader. I’m sure it is not immediate. While I’m not using 1sec for pushing the data (only for reading) I can clearly see when the SD is accessed and it is relatively rarely accessed: once a minute or so. once a minute or so. Correct… although the finest resolution of the file access is ONLY in minutes… so hard to say for sure in my case if the file is being rewritten more frequently. Of course, I think these are only showing the SuperChart data… thus yes, 1 minute value resolution. But again, does that equate the writing frequency of the master user file? As it seems to contain all latest vPin data values, even my once a second ones. I agree with this as well… I think this general OP topic’s concern is overrated… just don’t expect it to run forever and make backups. Blynk might be the straw that breaks the camels back, but the systems general writes is far more frequent (and potentially harmfull). Since I have at least 3-4 projects running “uptime in seconds” displays, there must be some form of RAM buffer then. This is where it gets tricky and outside my comfort zone! Uptime is read from /proc/uptime, which looks like a real file but it is, of course, not a real file! When accessed the values are generated on the fly from the kernel. The proc filesystem is a pseudo-filesystem which provides an interface to kernel data structures. It is commonly mounted at /proc. 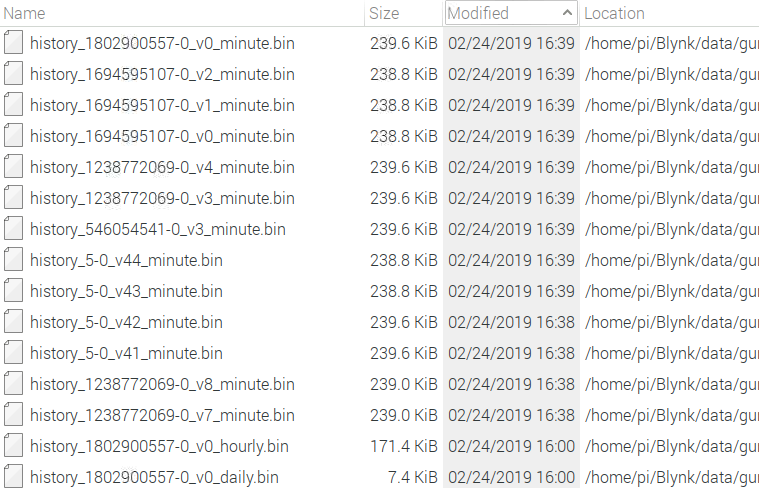 Most of it is read-only, but some files allow kernel variables to be changed. So my guess is that uptime doesn’t affect the values of iostat. My term uptime is in reference to my sending an incrementing value to a Display Widget every second from my sketch (based on that devices internal timers since boot)… The data shows every second in the App (although I probably could increase that frequency, to a limit, to test), thus must be updating in the master user file in the server every second… and even more frequently if from multiple devices that are not synchronized in their startup times. I honestly think the file is being written as frequently as needed… it is just that most “time” references for seeing such statistics is limited to rounded seconds. Probably. Guessing software developers wants to minimize r/w’s because it’s slower. it is just that most “time” references for seeing such statistics is limited to rounded seconds. “0,71 w/s” doesn’t look all that rounded to me. Hmmm… in my case it is 0,27 (~4 times per second)with all the above stuff up and running. But the onboard led tied to mmcblk0 lights up not more than once per 30secs or so. Can it be some RAM buffer is involved? But the onboard led tied to mmcblk0 lights up not more than once per 30secs or so. Can it be some RAM buffer is involved?